Outfits for SG50 Celebration: Let’s Paint the Whole Town Red! The Great Singapore is here so why not take this opportunity to do some shopping for the upcoming Jubilee Weekend Celebration and National Day 2015 in Singapore? Looking for something affordable? What if I tell you that there are fashionable items for this National Day Celebration sold at only 9 bucks? Talking about 9 of August, the day we gained independence! Let’s start the ball rolling with this sassy outfit for the lay-dies ( a little pricer but it’s a good buy)… and the rest of the items from ZALORA at a sale price of $9. At first look, you may think this a two separate-piece outfit but no! This is a romper and that’s the beauty behind rompers. It’s a 2-in-1 outfit. Lightweight and easy to wear. A perfect casual yet chic outfit for a day out during the long jubilee weekend! The soft and floaty top contrasts strongly with the black bottoms that toughens up the look and give it some attitude. This white classy belt is on sale at 9 bucks! Get the fengshui right by going with flow on lucky number ‘9’. Accentuate your waist with this white belt against a red dress or long red overalls. The gold tone hardware decorating the slim band design adds a touch of elegance and sophistication to the overall outfit. Dusty Red Basic V-Neck Tee by ZALORA BASICS crafted from a soft and supple material. Comfort is the key. It’s a stretchable cotton tee so go for a size smaller to bring the manly definition out if you are heading under the sun. The boy-next-door look that would grab the attention of any ladies. It’s not about how suave you look but how clean and tidy you appear. Heading for a event or party during the Jubilee weekend? 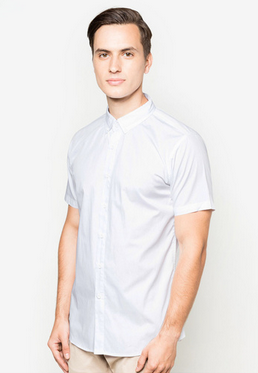 Go for this White Basic Short Sleeve Shirt by ZALORA BASICS features the classic button down collar with curved hem design. You will never go wrong if you pair this with a fitting jeans or khaki pants. Happy National Day, Singapore! Let’s take SG50 celebration to the next level when we take on the streets in red and white! Coupon code is applicable only to new customers and are for one time use only. Only one coupon code can be used per order. There is no minimum spend. Coupon code is not valid on marketplace items and non-sale items listed.